Mt. Kilimanjaro, the tallest mountain on the African continent, lies northeast of the town of Arusha, and rests quietly at the edge of the plains. With its incredibly beautiful snow-capped peaks, it rises above the Kenyan border, but stands totally within Tanzania, 330 km (205 miles) south of the Equator. Designated Kilimanjaro National Park fairly recently in 1973, it was officially opened in 1977. Just including the land above 2700m (8860ft), it is comprised of the Shira Plateau at 3962m (13000ft), and the peaks of Kibo, and Mawenzi, at 5895 m (19340ft) and 5149m (16894 ft), respectively. Below the park is an area designated as a forest and game reserve in 1921. Over a million years ago, the plains were immensely unstable, bulking and cracking from the powerful force of movements deep within the earth. The Kilimanjaro Depression was created as a result of this violent activity, and molten rock was forced up to the surface and formed the volcanoes Ol Molog, Kibongoto and Kilema along a 100 km long (60miles) ridge that reached 300m (9,843ft) in height. The formation of Kilimanjaro started 750,000 years ago, when it consisted of three large vents: Shira, Kibo and Mawenzi. Over thousands of years, Shira eventually collapsed, becoming extinct; Mawenzi remained active a while longer, but eventually also became extinct and began to erode; Kibo continued with massive eruptions that released black lava over the Shira Crater around 360,000 years ago, creating the area known today as the Saddle, at the base of Mawenzi. The lava also spread far to the north and south. This particular lava is known as rhomb porphyry lava (igneous rock composed of large rhomboid crystals embedded in a mass of smaller crystals), distinct because of its dark color and its crystalline shape. Though eruptions continued to occur, and Kibo reached a height of almost 5,985m (19,340ft), the mountain’s growth had ceased around 450,000 years ago, and the volcano in fact began to sink. Erosion helped create the tall jagged peaks of Mawenzi and Shira’s plateau, and Kibo, meanwhile, leveled out and was covered during the ages with ice and glaciers. The Kibo Barranco (a steep-walled ravine) was formed 100,000 years ago by a tremendous landslide. Kilimanjaro’s southeastern and northwestern reaches are speckled with numerous vents that erupted during the slow tapering off of volcanic activity in the area. In Kibo’s final burst of fury, the ash pit, the inner crater, and the present, perfectly formed caldera (large crater), were created and are now permanent features of this magnificent free-standing mountain. Although it can be climbed year round, the best times of the year for climbing are between June and October,and December and March, as between mid-March and May is the wet season. There are six different routes up the mountain, ranging in degree of difficulty: the Marangu Route (named “Coca-Cola”), the Machame Route (named “Whiskey”), the Shira Route, Umbwe Route, Maua Route, and Rongai Route. Meru, also in Tanzania, is a stratovolcano. Its history has been quite explosive, involving four eruptions, the last of which occurred in 1910. Lava erupted from Meru varies from thin flows to thick intrusive domes. The main cone of the volcano has a caldera which is 3.5 km (2.2miles) in diameter. It has a huge breach on its eastern side, and a graben runs down the side of the volcano from this breach. Many debris flows came through the breach in the caldera, which this covers 1500 sq km to the northeast, east and southeast. Following the eruption of this debris, a lava dome and ash cone grew on the floor of the caldera. Ol Donyo Lengai means “mountain of god” in the Maasai language. Exceedingly steep, it is a stratovolcano located in the east-African Rift Valley in northern Tanzania near Ngorongoro and Serengeti National Parks. The volcano is known for its unique type of natrocarbonatite lava, and, as such, is the only known active natrocarbonatite volcano on Earth. The diameter of the crater floor is about 350 to 400 meters and the elevation of the summit is about 2086 meters high. This little known mountain range is one of the gems of Tanzania. Located northwest of Dar es Salaam, the Usambaras are part of an ancient 25 million year old “necklace of mountains” called the Eastern Arc. The Usambaras offer incredible natural biodiversity — especially bird life, and great walks which culminate in breath-taking viewpoints. Trekking is based in the western Usambaras, which is a densely populated region of Tanzania, due to the cooler climate, thus making it good for arable farming. It’s the perfect place to get to know some of the local people and try some of the locally-run cultural tourism programs. Located in central Kenya, just south of the Equator, Mount Kenya is around 150km (95mi) north-northeast of Nairobi. The area around the mountain is protected as part of the Mount Kenya National Park, which is a designated UNESCO World Heritage Site. The national park is around 620km (240 sq mi), and receives up to 15,000 visitors every year. The stand alone mountain is an extinct (dead) volcano which last erupted between 2.6 and 3.1 million years ago. The highest peaks of Mt. Kenya are Batian, at 5,199m (17,058ft) and Lenana, at 4,985m (16,355ft). Its slopes include several different biomes: the lowest parts are dry upland forest, changing to mountain forest of juniper and podocarpus at about 2000m (6500ft), with a belt of bamboo at 2,500m (about 8,000 ft), that changes to an upper forest of smaller trees covered with moss and “goat’s beard” lichen. Above a distinct timberline at about 3500m (11,500 ft), there is an afroalpine zone, with its characteristic giant rosette plants. Twelve small (and rapidly shrinking) glaciers may be found scattered among the complex of peaks, of which Batian and Nelion are the highest. The highest point, Batian, is a technical climb; the classic Diamond Couloir climbing route is a Grade iv of about 20 pitch, up to yds 5.9 in difficulty. Nelion was first climbed by Eric Shipton in 1929, and Shipton and Bill Tilman completed the traverse of the ridge between the two highest peaks. Point Lenana, at 4,985m (16,355 ft), can be reached by a hiking trail. 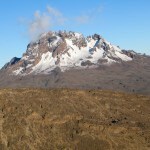 Mount Kenya is best climbed in January or February on the south side, and August or September on the north side. Mount Kenya is home to one of the Global Atmosphere Watch’s Atmospheric Monitoring Stations.